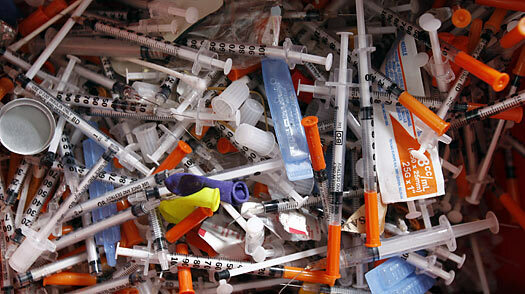 Addicts can turn in their used needles for new ones at the Needle Exchange, a government-run program. The Needle Exchange used to be located at a fixed place, but the surrounding businesses were unhappy with the concentration of addicts it brought to their area; now a van goes around to certain points where needles can be exchanged. Steve Bradley thinks that is a bad idea. He wants to go back to a fixed location, and he has reasons that might not occur to you and me. Steve runs ‘Connection to Freedom.’ Once he himself was deeply addicted to heroin and alcohol. While trying to rob a business to support his habit he was caught and put in Wilkinson jail. He knew he had hit rock bottom. That realization opened him up to Jesus’ offer to save him, and he accepted it. Soon he felt a call to share the good news with other inmates, so he started a mutual support group which he called Connection to Freedom. Released from jail, he took the program to the streets, aiming for addicts and ex-offenders in particular, though anyone with a spiritual need is welcome. But it is the street addicts for whom the Lord has given him a particular love. These days he meets with them in three locales: the Salvation Army, Our Place and The Mustard Seed. People tell their stories and share their needs, they pray for one another, usually they worship and, most important of all, Steve brings them a message from the Bible. Are people actually ‘connected to freedom,’ as the name of his ministry implies? Oh yes, he can tell you some stories. Other powerful events have happened. That happened at the Needle Exchange in Commercial Alley, where Steve had the use of a separate space for his group, and where many addicts found the Lord and a new beginning. Now that place is no longer available, and Steve thinks it is a shame. He approves of the Needle Exchange; had it been available in his days of addiction, he might not have picked up hepatitis-C. But, he points out, the Needle Exchange was more than a place to get clean needles – it was home. The people were given soup. They could use a microwave oven. There was a familiar face, there was somebody to talk to. Since the Exchange went mobile, all that is gone. He expects crime to rise as a result, and that government will realize it has to go back to a fixed place. Steve also does personal counselling and works at prevention. He talks to high school students about AIDS, drug addiction and sexual abuse. He has written work books for youth and also one for recovering addicts. Steve can be reached personally at steve.bradley@shaw.ca or 250-370-9341.